Admit it: when you tuck in for a meal at restaurants like The Cheesecake Factory, chances are you're not particularly concerned about the staggering amount of calories, saturated fat, and sodium you're about to absorb via a heaping plate of, say, Chicken Bellagio. But according to a new ranking of America's absolute unhealthiest restaurant chain meals, well, you ought to be. The Center for Science in the Public Interest, a non-profit public health advocacy group, released its annual "Xtreme Eating Awards" for 2016 on Monday -- a report that pointedly shames restaurants for serving meals that are insanely bad for you, unfortunately. And as you may have guessed by now, almost all of the salty, fatty, and sugary dishes sound insanely delicious. One of the worst offenders on this year's list is the aptly titled Whole Hog Burger at Uno Pizzeria & Grill. 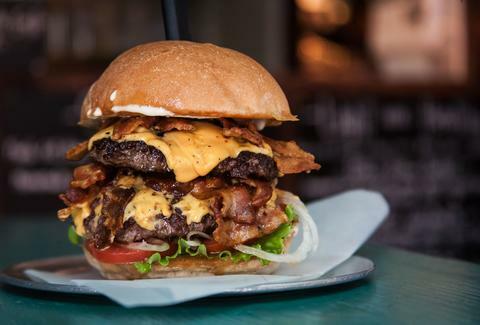 The massive burger comes topped with sausage, bacon, prosciutto, pepperoni, four types of cheese, pickles, and garlic mayo. Oh, and don't forget the fries and onion rings on the side. The meal packs a total of 2,850 calories, 62g of saturated fat, and 9,790mg of sodium. Basically, it puts even the notorious Bloomin' Onion to shame. Tony Merevick is Cities News Editor at Thrillist and just got really hungry. Send news tips to news@thrillist.com and follow him on Twitter @tonymerevick.